The Summerset Trail is a National Recreational Trail traveling 12 miles from Indianola to Carlisle. It is also a recognized destination by Rails To Trails Conservancy. The asphalt trail provides a variety of scenery. In Indianola you travel through industrial areas, then through neighborhoods. Next it’s the wooded sections through the state park area followed by open prairie and farm fields as you approach Carlisle. At the trail’s halfway mark is Banner Lake State Park. There you can ride the loop around one of Iowa’s trout lakes that was formerly a coalmine. Northeast of the park is a viewing tower built by an Eagle Scout from Indianola. 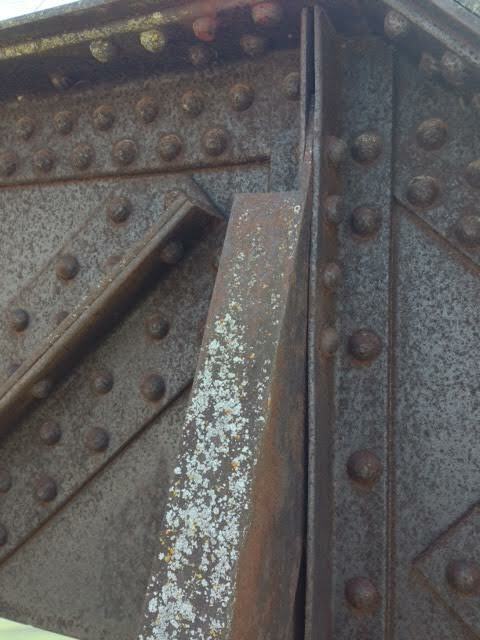 There are 14 bridges to cross on this trail some with rough thresholds. Be prepared for some big jolts. Don't be surprised to hear the sounds of gunfire as the DNR shooting range is also just outside of the park. The Indianola trailhead is located in the 300 block of N 5th Street. Parking, restrooms and water are available along with a picnic area. The trailhead in Carlisle is along Highway 5, just south of the town's last stop light. It has parking, a shaded spot to rest, and is conveniently located next to an ice cream and sandwich shop. Central Iowa celebrated Independence Day with weather uncharacteristic for July. Cloudy with cool temperatures in the mid 70's. The shift in temperatures and a break from the blazing sun, brought out marsh life along the Summerset Trail. 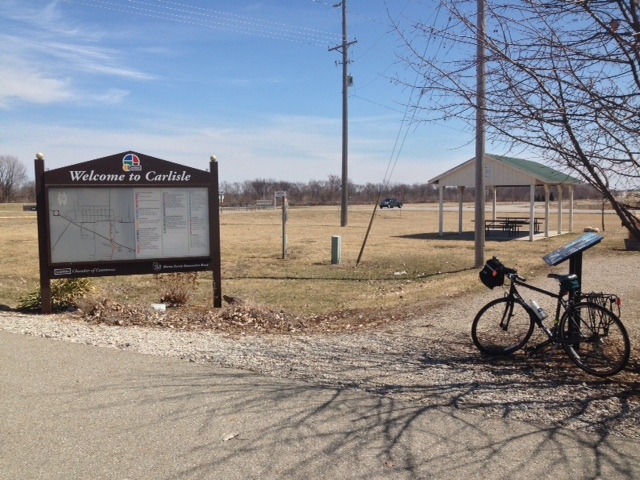 Leaving Banner State Park, my goal was a quiet and leisurely ride to Carlisle with the stop at the Eagle Scout viewing platform. On previous visits my attention was drawn to the panoramic view. This time it was centered directly below. So much to see. 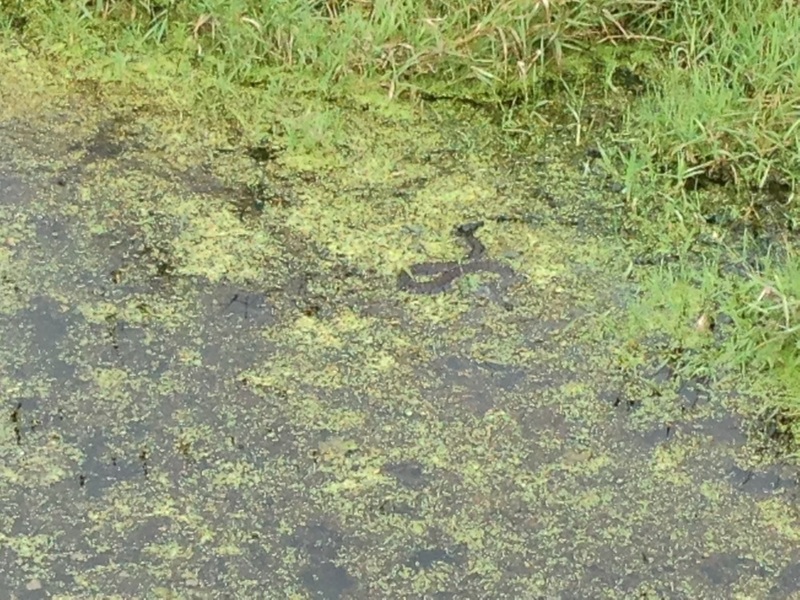 Huge frogs, creepy snakes and some very busy muskrats eating brunch. These guys cracked me up as they swam past using their tails to help propel them through the water. As I had hoped not many people were on the trail. Most were folks from Carlisle out for a run or walk. I selfishly hesitate to draw attention to the lesser known trails like this one. A quiet trail is always a refuge in the summer months of June in July as the rest of the state (or so it seems) is training for RAGBRAI on the popular trails. The Summerset Trail sits at the top of my list for a place to pedal away from the crowds. Writer for the recreational cycling website Iowa Bike Rides. The Indianola trailhead is located in the 300 block of N 5th Street. Parking, restrooms and water are available along with a picnic area. At the trail’s halfway mark is Banner Lake State Park. There you can ride the loop around one of Iowa’s trout lakes that was formerly a coalmine. The trailhead in Carlisle is along Highway 5, just south of the town's last stop light. It has parking, a shaded spot to rest, and is conveniently located next to an ice cream and sandwich shop. Indianola is a great place for combining biking, shopping, and eating. Who doesn't like that combination? The plan for my outing was to get a ride in, enjoy some coffee outside, and then spend some time exploring the town square. Before heading down the trail I needed some coffee! I had intended to bring my thermos along, but had left poor Stanley back home on the kitchen counter. Time to improvise. Arriving in Indianola I drove through Mudslingers and ordered a small brew. The accommodating baristas were kind enough to put it in a large cup. It ended up fitting in my bike's bottle cage just fine with the coffee not sloshing out. The only down side was it didn't stay warm. The price I had to pay for my forgetfulness. Only two days prior I had visited the Chichaqua Valley Trail . Because autumn's colors were still hanging on there I anticipated finding a similar palate along the Summerset Trail. However, I was too late. To quote Maxwell Smart: "Missed it by that much!" My luck turned though with another turkey sighting. 3 hens were out gobbling corn from a recently harvested field. I stopped and watched for a bit thankful for the fallen leaves. There's no way I would have spotted them otherwise. It was a quiet day on the trail. Literally. The shooting range in Banner State Park was closed so my coffee stop at the viewing platform was a peaceful one. I enjoyed my coffee and took in the scenery. Surprisingly enough there weren't any geese out on the water. After returning to Indianola I checked out the McVay Trail. It's a short stretch of trail but deserves a visit. Traveling behind neighborhoods it's flanked by trees and has a fun bridge to cross. Indianola has one of my favorite Iowa town squares. There are historic buildings, gardens, art and lots of interesting stores. My attention was immediately drawn to Pageturners Bookstore . They have an impressive selection of new and used books. This is a must-visit shop for bookworms. Lots of used books are priced at less than $2.00! There was no way I was leaving this store with out a treasure! Next stop was adorn. This shop is filled with LOTS of cool gifts and decor for the home. I found the perfect birthday gift for my niece and the store's owner Erin carefully wrapped it for me. This is a store I'll be sure to visit again and again. After popping in at Canoe Sports Outfitters and checking out their selection of Jamis bicycles, I headed to Funaro's Deli and Bakery and ordered a Turkey Pesto sandwich to go. Finding a picnic table on the courthouse lawn I enjoyed my lunch while admiring the sculpture Grandmother's Garden. My visit wrapped up with a walk around the square window shopping and admiring the RAGBRAI mural, Salem Court, and historical buildings. With the Summerset Trail close-by and a town square filled with specialty shops and small town friendliness Indianola is a great destination for a biking day trip. Wanting to get in a long ride before the spring weather turned chilly and rainy, my brother and I arrived in Indianola and began our ride at the trailhead on N 5th Street with plans to ride to Carlise and back. Lot of folks, both young and old, were out using the trail and enjoying the sunny day. Singing frogs and chirping birds were the only signs of spring. The trees and grasses still showed brown hues of winter. Sounds of gunfire came from the shooting range inside the park. On the open section approaching Carlisle, cars on the gravel road flanking the trail sent gritty clouds of dust to pedal through. Reaching town we took a short break at the local Casey's before heading back. Passing through the state park we took a loop around the lake and caught glimpses of riders out enjoying the single track trails. Bike rides with my brother are a nice change of pace for me. Along with great conversation there's a quicker cadence and faster speeds. He helps me stretch out of my cycling comfort zone. These are rides with the theme of "let's do this!...let's get there!" instead of the usual "tra-la-la...oh look at that!...better stop and take a picture" or "goodness there's bit of an incline....better find an easier gear". Riding with my brother keeps me focused and motivates me to ride stronger. Exactly what I need. I've ridden the last portion of the trail several times before always avoiding vigorous effort. I would tackle the long grade into Indianola with SLOW speeds, low gears, and sometimes standing out of the saddle. This time was different. I worked to maintain a speed that wasn't an embarrassment, didn't resort to lowest of gears and stayed in the saddle. Towards the end the "slight grade" certainly felt more like a hill. I made it into town sweaty, tired and accomplished. Thanks to my brother I rode the Summerset Trail like I never had before. The Indianola trailhead is located in the 300 block of N 5th Street. Parking, restrooms and water are available along with a picnic area. At the trail’s halfway mark is Banner Lake State Park. There you can ride the loop around one of Iowa’s trout lakes that was formerly a coalmine. The trailhead in Carlisle is along Highway 5, just past the town's last stop light. It has parking, a shaded spot to rest, and is conveniently located next to an ice cream and sandwich shop. I had a weekend all to myself. What was I going to do to fill the time? A bike ride of course! Arriving at Banner State Park I was surprised to pull into an empty parking lot. The last time I was here it was packed with folks trying their luck at catching trout. I unloaded my bike and headed out to the park loop. After a quick stop for a picture I was back on the bike when out of nowhere I’m passed by a cyclist. What the?? No call to pass, no greeting, just a “whoosh” of wind as he passed by. Apparently I was wrong thinking I was the only one at the park. Nature’s confetti of colored leaves were gently falling from trees and sprinkling the trail. A frog hopped it’s way across the trail and beaver gnaw marks on trees all caught my eye. What else would I find? During my ride back in April I saw the nest of either a Bald Eagle or Hawk off in the far distance. I also came across the remnants of a raptors lunch, but never spotted the bird. On this visit I was lucky enough to see it flying over the trail. A Bald Eagle was making it’s way back to the nest in the trees along the Middle River. Making my way to Carlisle I thought about how the views from the trail change during the seasons. Thanks to all the foliage I wasn’t feeling exposed and out in the open on the portion of trail that runs alongside the country roads. Back in April it was a different story. Reaching Carlisle I ventured over to Fiss’ for a treat. It was busy inside. Cheerleaders and their coach were packed around a table enjoying a lunch away from the high school cafeteria. I ordered vanilla cone and took it outside to enjoy. The remainder of my bike ride was more of a ramble than a ride. I stopped at the viewing tower, watched the waterbirds out in the marsh, and then meandered through the state park area enjoying the fall colors. Why hurry? I had all the time in the world. Summerset is a National Recreational Trail traveling 12 miles from Indianola to Carlisle. It is also a recognized destination by Rails To Trails Conservancy. Riders get to experience all types of habitat on this trail. Beginning in Indianola you travel through industrial areas, then through neighborhoods. Next it’s the wooded sections through the state park area followed by open prairie and farm fields as you approach Carlisle. My ride began in Indianola with the plan of riding to Carlisle then back to the state park to rendezvous with my husband and son who would be trout fishing. It was a beautiful day out on the trail. Even though it was a spring day the browns of fall and winter remained. The Indianola trailhead is located in the 300 block of N 5th Street. Parking, restrooms and water are available along with a picnic area. The trailhead in Carlisle has parking and a shaded spot to rest. At the trail’s halfway mark is Banner Lake State Park. There you can ride the loop around one of Iowa’s trout lakes. Along with fishing, hiking and mountain biking are available. This is a man-made lake that was once a coalmine. After turning around at the Carlisle trailhead I rode back to the park and located the guy’s fishing spot. Then I took a couple of loops around the lake before packing up my bike and gear. There are 14 bridges to cross on this trail some with rough thresholds. Lift up off your saddle to avoid the big jolts. 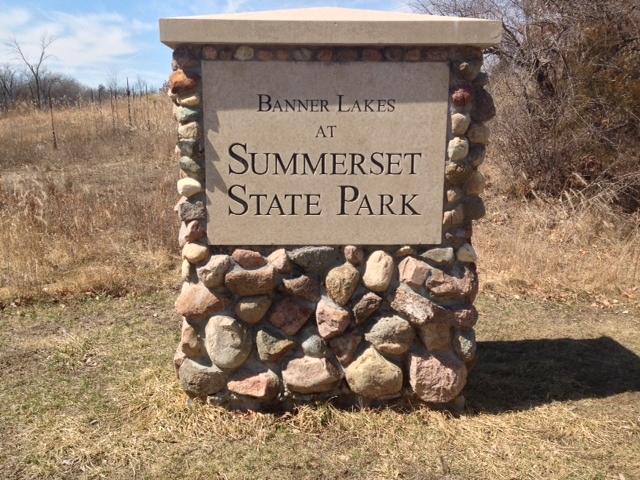 The DNR shooting range is located at Summerset State Park. Don’t be surprised to hear the sounds of gunfire on your ride. The park has a nice wide bike lane to use for taking a loop around the lake. Along the trail I pulled over on a bridge crossing a marsh area. Tons of frogs having woken up from their winter hibernation were singing their hearts out. It was such a cool sound. I tried spotting some in the water and grasses, but didn’t have any luck. Northeast of the state park area there is a viewing tower built by an Eagle Scout from Indianola. I stopped here and climbed to the stop to take in the view and eat a small snack. My love of bicycle riding has fostered an appreciation for bridges. Their design and patina give them an artistic quality. The view of the wetland and farm fields from the tower looked like something from a postcard. I captured the moment in a short video. Along the trail I noticed the remnants of a raptors lunch. I spied a very large nest in the tree line south of the trail and made the deduction that an eagle had eaten carp for dinner not too long ago. A warning of possible farm traffic was just west of Carlisle. 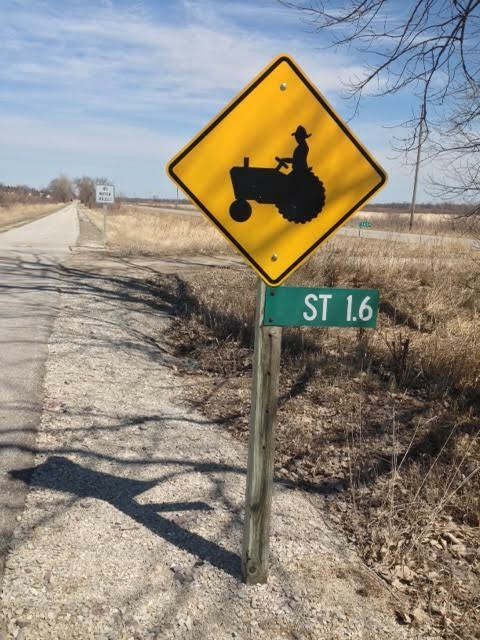 These days not very many farmers drive the types of tractors depicted on the sign. With trout having been released into Banner Lake that morning, the shores were lined with folks hoping to reel one in. Homemade energy bites were packed in my bag for my mid-ride snack. Later on I got to enjoy a delicious trout dinner thanks to my husband and son. Everyone in my family got to do something they love on this Iowa afternoon. Next time the guys mention fishing at Banner I’ll be sure to go along too...with my bike. 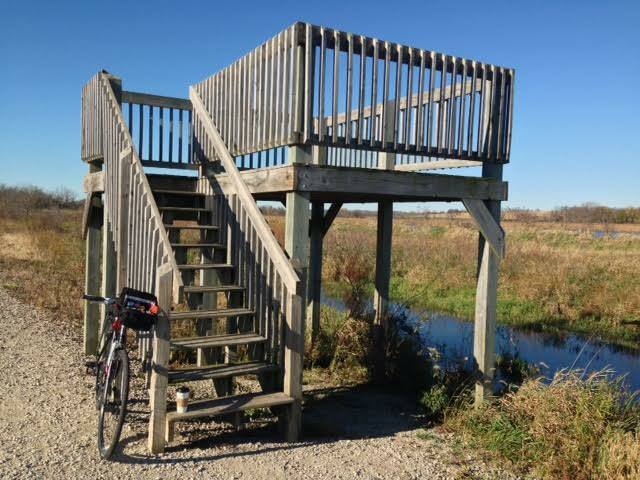 A cycling blog about bike rides on Iowa trails. A review of each bike ride is documented along with photos of sightings from the ride.